Will truck 460 Exhaust manifolds work in 70 torino? Got a 460 in my 70 torino, I was going to go with headers but dont want any bottoming out over speed bumps. I would go with shortys but to be honest, headers for this swap are kinda pricey. I was wondering if truck 460 exhaust manifolds will work? The manifolds will be less maintenance, less leaking (if any), more quite. Does anyone know if it will work? any specific years required? Re: Will truck 460 Exhaust manifolds work in 70 torino? 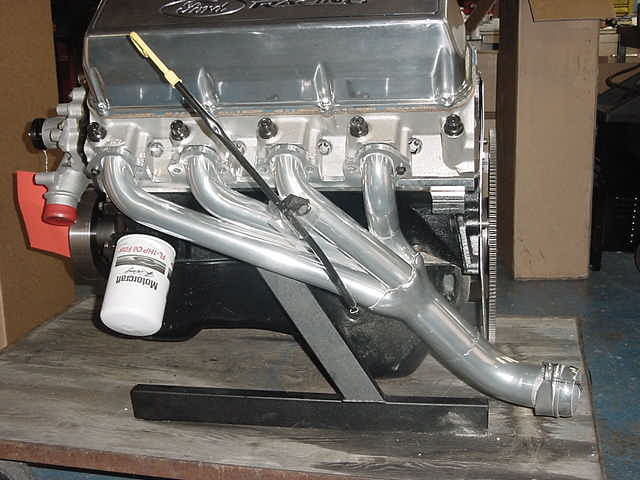 Andre.servin wrote: Got a 460 in my 70 torino, I was going to go with headers but dont want any bottoming out over speed bumps. I would go with shortys but to be honest, headers for this swap are kinda pricey. Andre.servin wrote: stan makes headers?? Yep..... Stan make shorty headers to fit a Torino. I believe he has some mid-length Tri-Y headers for that application, also. ^^^^^^ X2 on the Bird, but what kind of motor do you have because most exhaust manifolds will choke a performance motor to the equivalent of a smogger motor with mediocre performance and crappy gas mileage. Also is it manual or power steering...if it is manual you will have more header clearance without the PS ram, if it is power you can get a drop bracket for the PS ram and make room for the headers. Okay cool sounds good I will call Stan. Yea im making the engine a solid low maintenance daily driver 460. So it's stockish but has a nice Holley double pumper, a mild cam, and I wanted to put headers on it to help with more breathing. I will look around for some headers. I don't think I will find any exhaust manifolds for it. Simply because I know I can find a 460 in a truck at the wrecking yard to take them from but an old thunderbird? No way. At least not where I'm at. Andre.servin wrote: Okay cool sounds good I will call Stan. Stan Johnson has a mid length header specifically for that application. The truck manifolds will indeed work in your 70 torino-I have a set in my 71 ranchero and the fit just fine-good luck on your project!